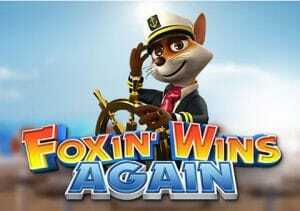 Foxin’ Wins is a very popular video slot from NextGen Gaming which has 5 reels and 25 paylines. Available to play across desktop, mobile and tablet devices from 25p to £50 per spin, this game is based on an aristocratic fox. With 3D, cartoon graphics, it uses the SuperBet mode and benefits from 3 bonus features. A colourful game with a cheesy and upbeat soundtrack, symbols on the reels include the fox in a sports car, a mansion and wads of cash. The fox himself is the game’s wild and is the highest value symbol as 5 on a payline will reward you with 2,000 times your line stake. As mentioned, the game uses the SuperBet mode – Fox Pups hide inside the reels and pop out randomly turning symbols into wilds. If playing with SuperBet mode off, a Fox Pup will only appear on the middle reel (randomly). If you choose level 1, which costs you 35p at minimum stake, Fox Pups appear on any of the 3 middle reels. If playing at level 2, costing 50p at minimum stake, Fox Pups can appear on all 5 reels. The SuperBet mode is beneficial in the Free Games feature which is triggered by getting 3 scattered pots of gold anywhere on the reels – you will begin with 10 free spins with all wins doubled (2x multiplier). If the feature, more Fox Pups appear giving you a frenzy of wilds. You can also retrigger the feature giving you 20 free spins in total. There’s also a Fox Funds feature in the base game– foxes are generous creatives and can sometimes top-up your balance with fox funds. There is also a Leprechaun Shake Down feature – if you hear a leprechaun, the fox will shake him down looking for gold. The fox holds the leprechaun upside down with gold coins falling to the floor – which are yours. Both features are triggered randomly in the base game after a winning spin. Foxin’ Wins is an entertaining video slot for sure with the bigger wins coming in the Free Games feature – the appeal of a 2x multiplier and more wild symbols is great. You can only win big if you use the SuperBet mode at level 2 where fox pups appear on all reels. If you want something a bit more hard hitting, NextGen Gaming’s 300 Shields is a must.